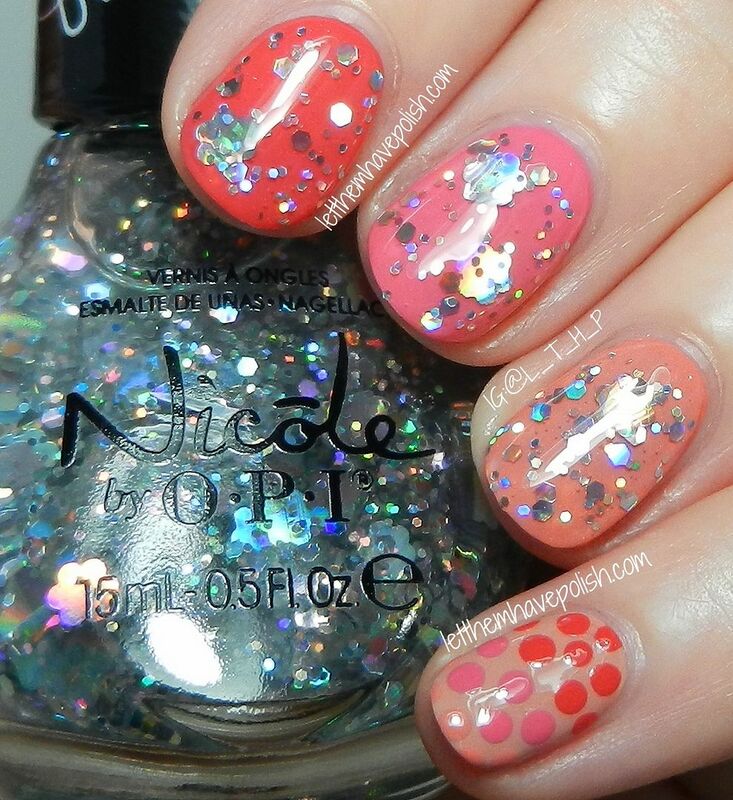 For today's post I want to share this adorably girly obre look featuring the Pink and Coral shades from Nicole by O.P.I's Carrie Underwood Collection. For this look I also used the glitter topper from this collection. Sometimes less is more, right? Even though there isn't much to say about this I just love how girly and fun these nails look. This ombre features (from Index to Pinkie): Some Hearts, Color me Country, Sweet Daisy and Southern Charm. These are all beautiful cremes with beautiful formulas. On my Pinkie and Thumb I did a dotted gradient using the Three Coral and Pink shades over Southern Charm. I topped the other Three nails off with Party Bus. Party Bus is a fun glitter topper made up of Silver prismatic hexes in varying sizes, and even some Flower shaped glitters. I did have to do some fishing for the Flower glitters. I picked them out with a toothpick and placed them, then did a second coat of the glitter. To finish off my nails I did a top coat of Seche Vite. I used Three coats of each color. The formulations on each shade is very buttery smooth and self- leveling. Some Hearts is a bright hot Coral creme. Color me Country is a sweet shade of Pink with slight Coral undertones. Sweet Daisy is a gorgeous shade of muted Coral creme. Southern Charm is a classic shade of Beige creme with slight Brown undertones. I am just in love with these shades. Thanks for stopping by today my loves!! Today I have a pretty, Summery look featuring shades from Zoya's Irresistible Summer collection. 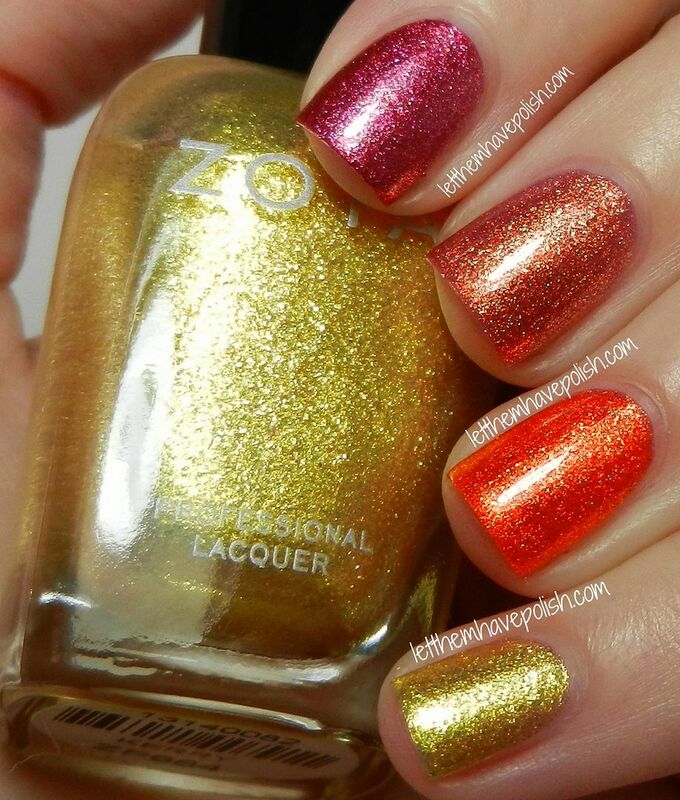 The Irresistible collection is the shimmery half of Zoya's Summer releases. The set features Four warm shades and Two cool tones (which I will be featuring in a look soon). For this look I used the Four warm shades in a stamped ombre look. I couldn't bring myself to just swatch these beauties. I wanted t have some fun with them and bring them together, an ombre mani seemed like the perfect way to combine these gilded pretties. This look started with bases of (from index to pinkie) Bobbi, Tinsley, Amy and Kerry. 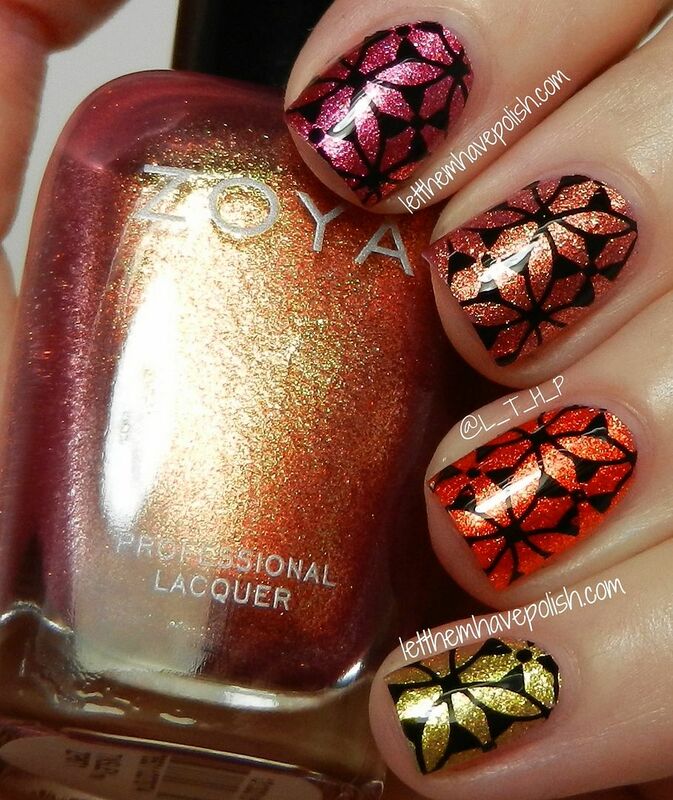 I am always in awe of Zoya's ability to make beautiful, outstanding shimmering shades. I accented my bases by doing some stamping with Pueen plate Pueen49 and KOnad Black special polish. I love how the finished look is a little bit like Christmas in July :D. Something about these remind me of ornaments and I just LOVE em!! All topped off with some KBShimmer Clearly on Top. All of these shades have AMAZING formulas. I used Three thin coats of each color to achieve a really rich, shimmering effect. I needed no clean up. There is nothing I can say about these that the photo has not already said for me, I am just in AWE. I could never pick a favorite from these Four because they are all as stunning as the next. They all seem to glow from within, that is such a Zoya signature. I must say though.. Amy(Orange) and Kerry(Yellow) are really something SPECIAL! Have a wonderful day my loves!! Now go forth and be fierce! It's only been about an Eon since I've done a Pink Wednesday... So, here is a Pink Wednesday post ♥. A few weeks back I received the Inglot Colour Play pastel range. These babies are perfect for ombre manis, they really take the guess work out of picking your shades. For this look, I also went back to my roots by doing some stamping. I used my Pueen Love Elements nail stamping plate set. 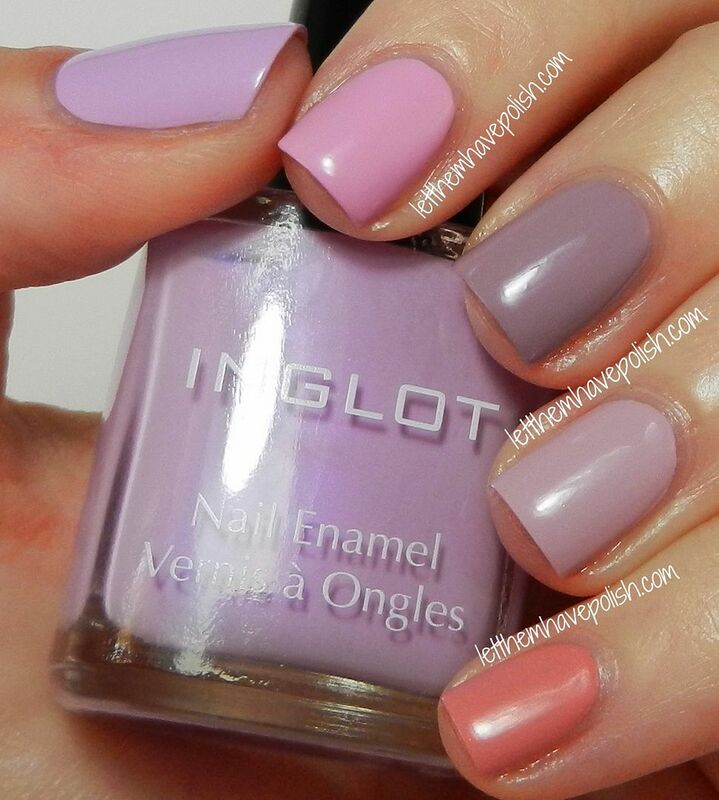 This look features Inglot Shades, from Thumb to Pinkie: 388, 387, 386, 385 and 384. For the stamping I used Konad Black Special polish and Pueen stamping plates Pueen 32 on my Middle and Ring finger and Thumb. For my Pinkie and Index nails I used Pueen 28. To finish my nails off I did a coat of Seche Vite followed by a light coat of IN Northern Lights. Here are my base colors before stamping and top coating. 388 is a clean, light Lilac purple creme. 387 is an aweome Blue toned bubblegum Pink creme. 386 is a muted Violet- Mauve creme. 385 is a light Pink- toned Mauve creme. 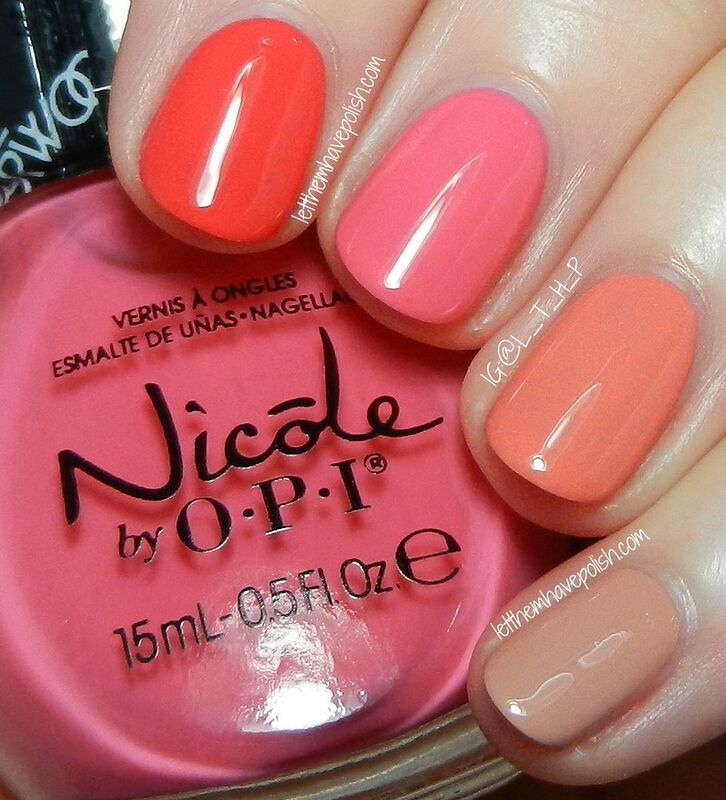 384 is a beautiful muted Coral creme. All of these polishes have a slight flash of smooth complimenting shimmer. You can see the Golden shimmer in the bottle photo above. That said, the shimmer does not really translate to the nails, but it does aid in appication. All of these were really easy to apply and all did well in Three, thin and easy coats. I miss stamping so much. But at the same time, I'm pretty excited because I have all of these awesome Pueen plates that I have not really gotten to play with yet. So I have those to look forward to :D. I have been terrible about keeping up with plates honestly, if you guys know of any sets I may have missed out on, or new brands, share them in the comments!! So, I am LOOOVING these Inglot Colour Play range. I love them so much, they have even earned a spot on my wall racks. These are great for nail art of all kinds and I just love the formulas and beautiful shades. Thanks for stopping by darlings!